Recently one of my authors, Carrie Vaughn announced the end of her main series. I call her ‘one of my authors’ because for the past 6 years I could always count on her to have a new book (or two) out each year. For someone who reads as much as I do this is important. Star Wars was winding down and not producing as much in the past and I have to have a book on me all the time. She’s an author that I’ve met and hung out with on several occasions over the years that I adore because she’s so personable and always forthcoming with the fans. 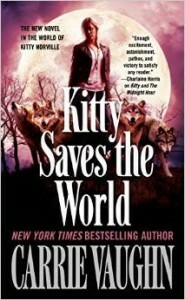 For years she has said, “If you ever see the title Kitty Saves the World, that is the last book for my main character. So as an avid reader I’m sure you can all imagine my dismay at seeing her Facebook post a few weeks ago with the image of a new book with that title. One goes through various stages of grief all in an instant when one finds out a favorite series is ending. However, upon further reflection I heartily applaud Vaughn’s decision. 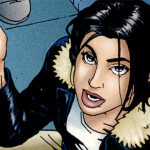 Carrie Vaughn is making a choice to end the story arc for her main character, a werewolf named Kitty. The supernatural world she created, though, is so much bigger than just the one character. So perhaps we will see books featuring other characters. She has already experimented with this and stated there is a big possibility for such books. She is doing what other authors who get bogged down with a certain set of characters should do. She is doing what Star Wars needs to do with this reboot. Another example of an author who knew when to walk away is Charlaine Harris whose books were the inspiration for True Blood. While I sometimes regret not being able to go to the bookstore and pick up the new Sookie Stackhouse book, part of me appreciates knowing there was an end for those characters. One could also look to J.K. Rowling who stopped at seven books for Harry Potter when she easily could’ve started next generation books with new bad wizards for the characters to fight (to be fair she still might do this.) I like having an end to a series. I didn’t realize how much I liked it until Vaughn’s recent announcement. Anakin Skywalker’s story should be over. We’ve had movies, books and the Clone Wars TV series all centering around his life. Let him be done. Darth Vader should also be done, but I’m not going to delude myself into believing that will be the case though. There is a certain way I can accept him being included in the Rebels TV show if it means he ultimately ends up killing Kanan and Ezra. Some of my thoughts on that were laid out in Friday’s Not a Committee discussion. Vader’s street cred as a villain could really benefit from destroying those two though which is why I’d like it to happen. The previous EU stories really made me wonder what the galaxy feared with all the blunders Vader had in those books. Too much information ruined the mystique of Darth Vader for me that I acquired in the OT. I’ve previously written that Luke Skywalker needs to die in the new trilogy. I’ll rescind that if and only if there is a set date/book to end his story. Not end as in die, but end as in no longer be the main focus/hero to save the day. They need an exit strategy for Luke, Han and Leia. The previous EU was ruined towards the end there, in my opinion, with the inability to let those characters rest; to move on to the next generation. The galaxy created by George Lucas and expanded by a multitude of amazing authors throughout the years does not need to revolve around just a few characters. In fact, if they look at fandom Boba Fett and nameless stormtroopers have the ability to carry the stories and bring in the money because I get it that they need to be making money. If those types of characters can carry a story and sell merchandise then they don’t need the big three to be the center of everything. However, if they don’t intend to pass the torch then I still stand that Luke needs to die to mirror Qui-Gon and Obi-Wan in the first two trilogies. I’m still holding out hope that this worry of mine is unfounded. That the ST will address all of this correctly and be a passing of the torch movie. We’ve seen Star Trek for years pass the torch to new characters and continue to do just fine. Recently we’ve even seen a passing of the torch to new actors for known characters in an alternate universe concept. This works in the genre that Star Wars falls in and they need to remember that. If they don’t, then they need to remember that it is okay to end a series. We, as readers, have seen what happens when they continue to drag out a storyline with aging characters. Sixty is the new forty was kinda funny. Eighty is the new forty was not so funny. It is easy to get why an author wouldn’t want to do this. They write stories to make money; that is how they survive. If they give that up then they have to invent something new and that can be a lot more difficult than writing something more familiar to you and continuing to interact with characters that you’ve spent ten years of your life with as Vaughn has with her characters (2005-2015). Star Wars is unique in that they’ve got multiple authors working on books at the same time in several different areas of the galaxy and sometimes time frames. Most of these authors also have their own projects and I think would happily love to create characters to explore the galaxy. Give me a slightly compelling story, a cocky fighter-pilot and a loveable sidekick and I’m buying into that character’s life. I want to know everything. 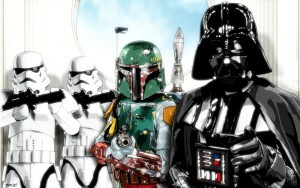 My favorite part of Star Wars has never been the big three. The books that I reread every year don’t involve the big three except for minor appearances. Star Wars needs to learn from authors like Vaughn and Harris who had specific end dates for their main characters in mind and were intelligent enough to stick with it. I applaud them. 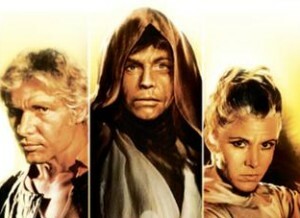 Somewhere along the line, over the last decade, give or take a few years, for some EU fans, the desire to have a continuing story became the requirement for us to have a complete story of Luke, Han and Leia up to and including their deaths, that simply allowing them to exit quietly stage left wasn’t option. Practically that gave us the Dennigverse and the horrible one-liner ’60 is the new 40′ to justify the continuance. At the same time the flare-up around the Legacy comics century time jump practically ensured that there would be no more of those either, thus condemning Luke, Han and Leia to no retirement allowed. Endings do matter but an ending does not have to be the death of a character or characters. The Malazan books are quite infamous for never giving the reader a complete picture at either start and end, there’s always questions remaining, some threads unresolved, but none of that stuff is the story being told in that particular book at that time. What about plot strands 1, 2 and 3? Ah, those are other stories, some may have been told, some may yet to be and some never to be. Thank you for the kind words! I agree that it doesn’t need to end in character deaths. The Charlaine Harris series didn’t have the characters die in the end and I highly doubt that Vaughn is going to kill off her main character. An example of transition (although unintentionally and backwards) would be Ben Kenobi. He’s not the main character in A New Hope, and even if he made it off the Death Star, he wouldn’t have been. Because… well… you let the kids do it. You move the big three to positions of authority where they aren’t hands on — you don’t have Yoda doing a ton hands on until the end of Ep 2 and 3 — before that, send the young folks to do it. It would be easy enough to have Luke, Han, and Leia grow into leaders and mentors — which is what I hope they actually become.